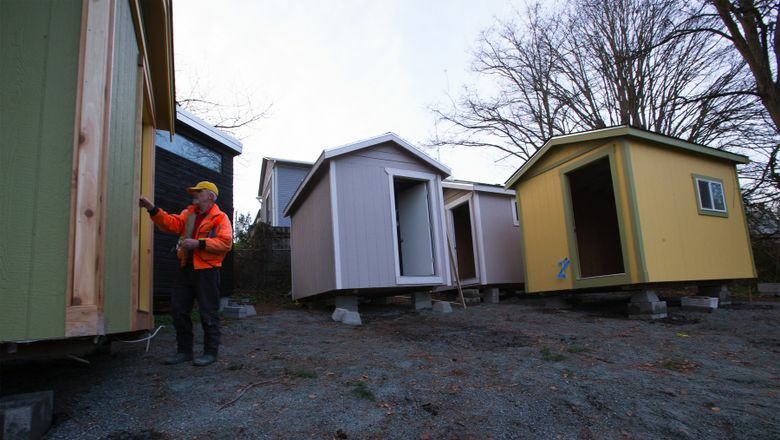 A new community of tiny houses for the homeless in Seattle builds on experiences at Portland’s longstanding Dignity Village. PORTLAND — Fourteen years ago, dozens of homeless activists moved onto a bleak asphalt lot on the outskirts of this city to erect their tents in a place they named Dignity Village. Over time, the tents gave way to an eclectic array of structures that lack indoor plumbing and — in most cases — electricity. The village, self-governing and self-financing, improbably endured, and along the way helped to pioneer a new way of thinking about community shelter for people seeking to get off the streets. Dignity Village’s successes, as well as its setbacks, have reverberated in the Puget Sound region as the growing number of people facing life on the streets has prompted a search for more alternatives. A year ago, a task force report to the city of Seattle cited Dignity Village in a recommendation to move forward with small-scale housing for the homeless. Nickelsville on South Dearborn Street in Seattle includes a few wooden structures, as does a new camp that opened this past month on city-owned land in Ballard. 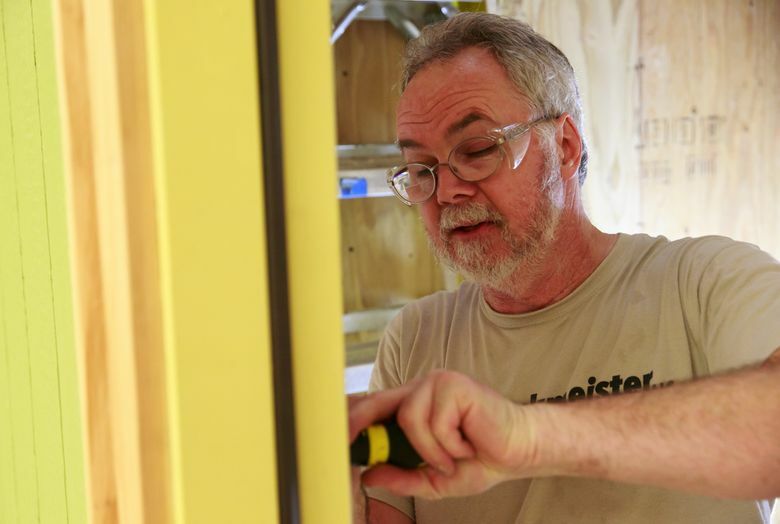 Later this month, a new community of 15 tiny houses, complete with electricity, is scheduled to open on a Central District lot owned by Lutheran Church of Good Shepherd. 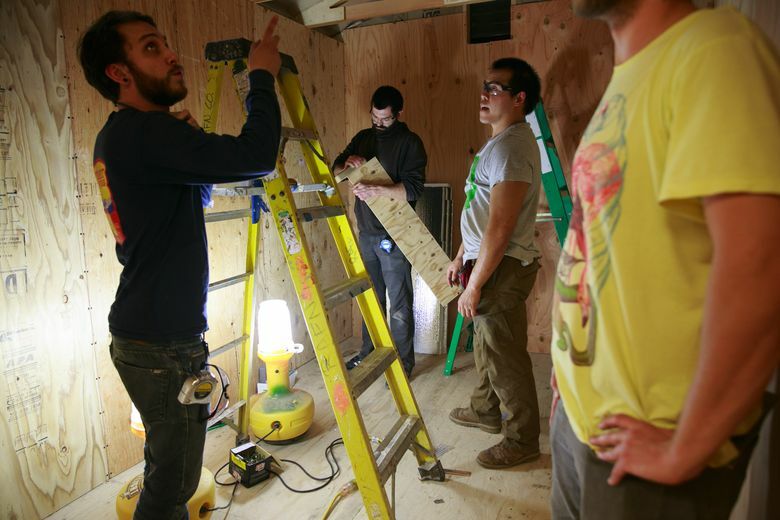 These 120-square feet homes contain about $2,200 worth of materials. 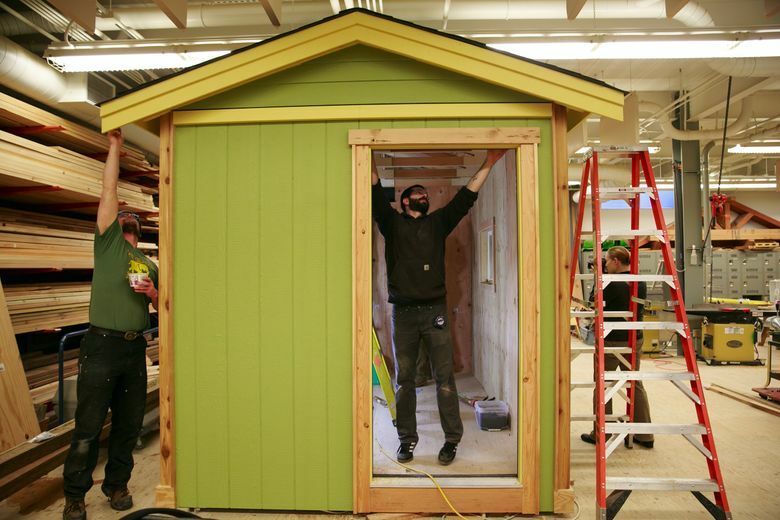 Labor to build them was donated by several groups, including Franklin High School and Seattle Central College students. 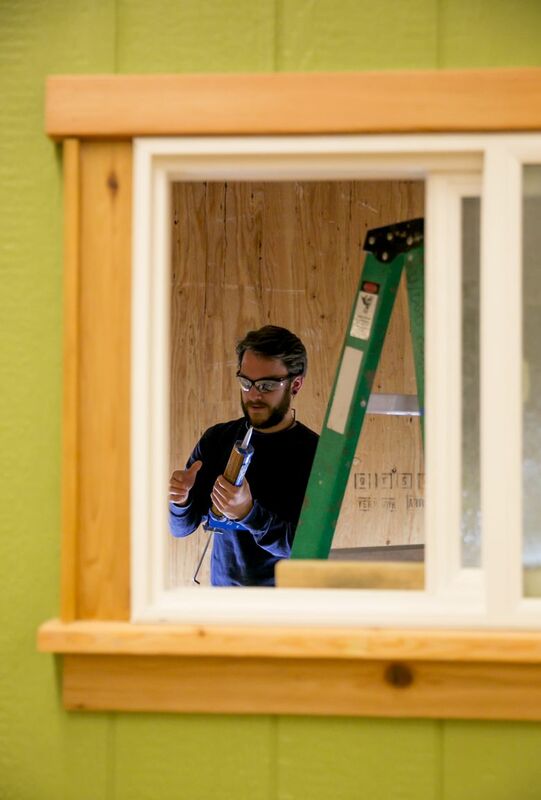 “This has been a great learning experience because we’ve been doing almost everything we would be doing to build a normal house,” said Sarah Kautz, a 29-year-old Seattle Central student who helped install insulation last week on a unit painted avocado green with yellow accents. These structures will have electricity in each unit, and access to flushing toilets and a community kitchen on the lot. And, the Low Income Housing Institute hopes to help the residents of this new community transition within six months’ time to permanent housing. While new Puget Sound homeless villages benefit from government and nonprofit support, Dignity Village was born out of protests against the status quo. That history helped shape a community whose members have sought to keep their independence even as they have struggled with funding to improve the site. Back in 2001, homeless activists clashed with Portland police as they defiantly erected tent encampments in the heart of downtown. After a series of standoffs, one group reluctantly accepted an offer to move to what was supposed to be a temporary site, a city-owned lot some seven miles from the downtown. The decision triggered controversy, with some activists saying the remote site — a block away from a correctional facility, adjacent to a pungent leaf-composting operation and far from grocery stores — was destined to fail. But over the years, the village gained a greater sense of permanence as tents gave way to structures, and the city of Portland entered into a series of leases with a nonprofit formed by Dignity Village and run by a resident board. Today, some of the 43 village dwellings are straightforward cottages built by residents or volunteers. Others have more whimsical architecture, such as the house known as “the castle” that features turrets or another one that resembles a barn. Every resident must contribute 10 hours of community work each week, and pay $35 a month to live at Dignity Village. That money, along with a small firewood and recycling business, makes up the bare-bones operating budget that last year was less than $27,000 and has yet to be able to finance a transition from portable to flushing toilets. A minority of residents have stayed in the village for years and have dreamed about eventually moving to a new site where they could form a long-term community. But most residents have much shorter stays. A 2010 report contracted by the city government found that more than 60 percent of Dignity Village residents left within six months of their arrival. While some leave voluntarily, others are booted out by the community government for breaking rules that include no alcohol and drugs on the premise or constant disruptive behavior. “It’s ups and down. We’ve had quite a few people who have these outbursts and it’s really hard to tell them they have to go,” said Rick Proudfoot, a village resident who has served this year as its chief executive. Though there are success stories among former residents who now have jobs and stable housing, Portland city officials also have been concerned about the numbers who are back on the streets once they leave. The 2010 report found that 70 percent of the people who left the village ended up homeless again. So, city officials asked for JOIN, a Portland nonprofit, to assign a staffer to help residents find permanent housing and help with other tasks. The new homeless community of small houses opening in Seattle’s Central District shares some things in common with Dignity Village. With the assistance of Nickelsville, for example, the community will govern itself. Residents will be asked to make a financial contribution ($90 a month for utilities) to stay there. They also will be asked to work at security, cleanup and other jobs, according to Lee, of the Low Income Housing Institute. But there are also some big differences that include more institutional support at the Central District community. That translates into improvements in infrastructure and more assistance for residents. From the onset, the Low Income Housing Institute staff will focus on finding permanent housing for residents. Lee, the institute’s director, says she hopes the small-house movement can spread in the Puget Sound region. “We can do hundreds of tiny houses, but we do need land,” Lee said. One option is to put more of these structures at the two encampments on city land at Ballard and Interbay as well as a third camp that will be opened on city land in the Sodo District. 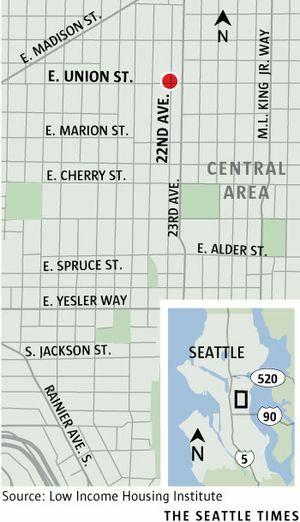 Seattle Mayor Ed Murray, in an interview last week, said he would consider placing more small homes on city property. “But my concern is that, and what we have seen this with encampments, legal ones, is that people are not moving out, in many cases,” Murray said.